The buried re-emerging into the make-public domain. Metadata (data about data) in PDF format. Commentators on a video or in print, extract and present. Spilling out about the secrets and lies. Might take whistleblower's risking all for 'public interest' and humanity's well-being. The outcome of 'discovery' -- the US term in court -- and now 'on record'. Those who knock doors, confront on the streets, make calls... anything... to push for crime-busting and attempt to re re-order the world. Make better. If I/we don't -- it won't. We'll pick up rubbish. Help an oldie struggling or a young one upset. Those who can -- do what can. Well-respected moves but how about? "Mummy/Daddy what did you do during the Freedom (of speech) Wars?" Or, how about the meeting with God? Of course, the cross is the cover and power to stand -- but what about them damn lies, we turn(ed) eyes and ears from? What about the consequences of complacency? Does the Bible say; "Forget this world, give up, or if political, keep it mild and fit in the Liberal or Conservative pen". OK, most people too challenged and in survival-mode to care. As for the more comfortably-off? Too concerned with 'living a full life' and keep heads-down social security. And on the big-wider-rest? Understandable confusion over, what's there or matters, is difficult to grasp. Plus; Why trouble, trouble? Worrying about "...what?" Short life and not for fixing out 'there'? A train in vain? Wasted effort? Reckoning, what the authorities do, their side-kicks, the supposed overseers of the overseers. For fifty years -- up to about a decade ago -- all a bit boom while low on the gloom. Even the UK's struggling 70s seems inconsequential compared to the new times-a-coming. So what happened about 2010 and why the dipping down? Is it, the internet peaked, and now a bit "done that". Which could be asked; "Did... What?" What you have said in the dark will be heard in the daylight, and what you have whispered in the ear in the inner rooms will be proclaimed from the roofs. 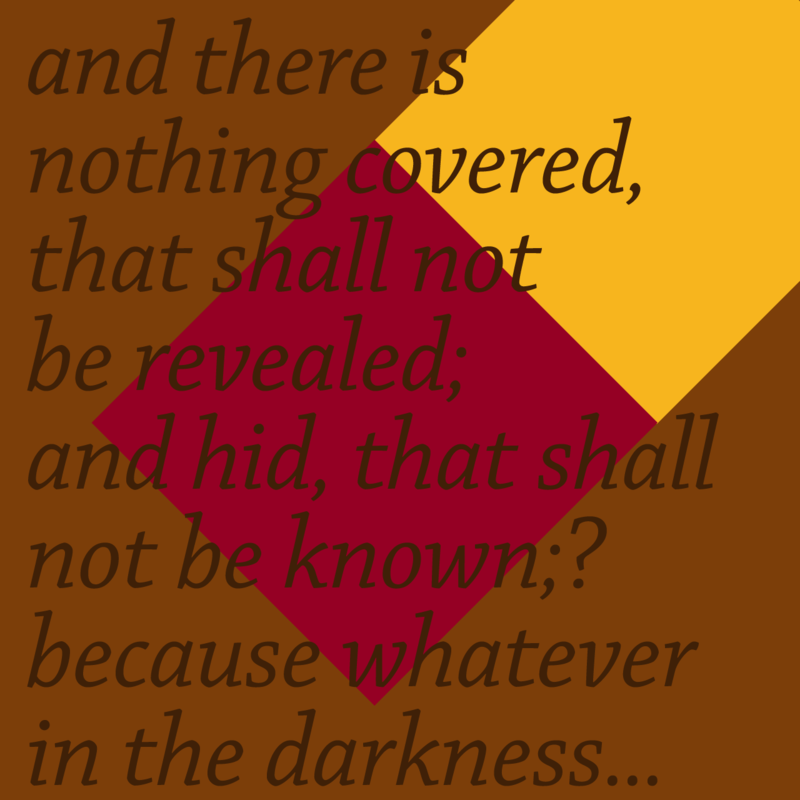 There is nothing concealed that will not be disclosed or hidden that will not be made known. The movement of the Spirit of God among us is for disclosure of deceptions. One day and full-on/happening, yet until, the battle is on and -- seems to me -- few on the frontline. Do I mean; 'writing blogs and making expose-the-criminal vids'? Ones and two's, attempting to join the chorus of protest. Face the barrage of disinterest and being another a-lone-r with keys and a mouse. It's something and makes personal, mental-health, sense. On influence though? Could encourage another to join the choir. Might as well, although membership's on the decline. Bustling early-2010s it ain't. These days, under a new wave of censorship. TV-type's pumping out derision to reinforce must 'stay in ya pen', oh ye little leftie or righty. Internet and alternative exposure talk is becoming innocuous and redundant. Because of TV and The Press. TV News especially, revealing for all to see. In 2019 we're into the unashamed, unabashed, selling slavery (ours) and shilling for the pit. As in 'pit of...' hell. Described as demonic and unseen personalities. Raging and wrecking through our need to DIY -- for them. Their claim against Christ: 'We prefer their images over God's'. It's about this. The takeover by disciples of devils. With TVs, taxes, and the military and scientism industrial. 2010-ish something happened, shifting us from the previous decade on the internet. 2020-ish and the necessity to hide is disappearing. Have we noticed the BBC-like News at 6 or 10? Every opportunity -- same report over two or three nights -- the story, behind the story, is blatant darkness. No, hold-back and be careful, pushing too hard. Gloves off and the full volume and HD vision of their destruction, unfolding, for their pay and master. The enemy comes -- so says the Bible; as light and pretend progress. The trusted expert's concerns about health and prosperity, technology and tomorrow. The weather and medicines, space and the invasion of our bodies with the artificial. We don't need to best-read the times through alternative internet-led investigations. It's all on the News: If we know how to read? Ask: What is the message behind the innocent-sounding coverage? ALL-am-saying is there's a distinct acceleration to embrace the 'Brave New World' ahead. The unstoppable, it's claimed, one. So, "jump on up and enjoy the ride folks" is blaring. Target; the 'richer' lot who/think, can buy their protective bubble. Have delivered their necessary antidotes and cures. To the door, behind the protection and isolation. We've arrived with the box, not in a room but our pockets. Forthcoming attraction, and connected by stealth. Seen, daylight bright -- on the News. As boiling frogs, we find it hard to always notice. My observation is turning into '19, the heat's gone up and deemed ready to feel it, without much of a squabble. 'The Controllers who govern the World State have maximized human happiness by using advanced technology to shape and control society' (Aldous Huxley).